If you are seeking truth, you have come to the right place! In the book Bamboozled Believers and on this site, I am proclaiming truths that are producing a paradigm shift in the way that Christians view the world. I am adding my voice to a growing chorus of writers who are calling for a new reformation. I have written a book that is hated by people who are afraid to read it. Although it is loaded with Scripture, this book is intended for non-believers too… that’s because many true believers cannot bring themselves to contemplate the truth that it proclaims. It is an exposé of a spectacular mass delusion and an exposé of our long-suppressed, vicious church history. It is a Bible study for thoughtful agnostics and atheists. 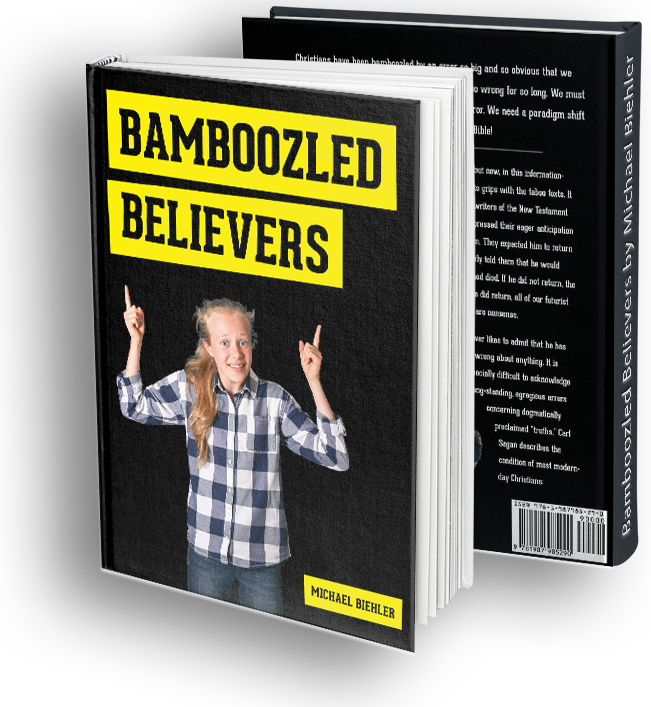 Bamboozled Believers is a gauntlet thrown at the feet of all Christians daring them to take off their blinders and to accept what the Bible so emphatically teaches. As you read, you will be intrigued, entertained, informed, and even amused; but above all, you will be challenged to think. It is a dangerous thing to be right when the established authorities are wrong. A properly translated Bible never mentions the “end of the world.” Jesus predicted the end of the age of animal sacrifice and temple worship. He never predicted the end of the world. Jesus told his disciples that he would return as judge before all of them had “tasted death” (Matt.16:27,28). Jesus’ disciples expected him to return before John had died (John 21:23). Many Christians watch for signs of the Antichrist as they dogmatically insist that the last days prophecy about the second coming of Jesus Christ is about to be fulfilled. Clutching their Billy Graham Bible study on end times prophecy they wonder and worry: “When will the rapture happen?”, “What are the signs of Antichrist?”, “Will I be left behind?”. They fear barcodes, the mark of the beast and the “one world government.” Dear pilgrim, give your head a shake! Christian demagogues from Martin Luther to Billy Graham have given us five hundred years of failed prophecy about the end of the world. Would you like to know what the Bible actually says about Jesus’ second coming? In Bamboozled Believers you will see that feeble scholarship and pure hubris have combined to create and sustain Christianity’s grand delusion. The Perfect Title for a Book on This Topic! An excellent resource on Fulfilled Prophecy! Jesus said that no man knew the day or the hour of his coming; but Peter said that he was living in the “last days” and almost forty years later, John said that the “last hour” had arrived. Our bamboozled spiritual godfathers want us to believe that the “very little while” stretched into a “delay” of 2,000 years and counting. And the “last hour” has stretched on for 15,000,000 hours! These spiritual gurus quote rapture bible verses out of context to whip up rapture fever. Last days prophecy, especially rapture prophecy, is lucrative big business; the charlatans fleece the flock and as time goes by they pump out increasingly absurd speculation about the Antichrist boogieman and the secret rapture. Has anyone noticed that the Bible teaches a first century rapture? Two thousand years ago Paul told the believers in Corinth that they would “not all die”, that at the last trumpet, in the “twinkling of an eye”, they would all be changed. Let me repeat, he wrote to people who lived 2,000 years ago and he said that some of them would not die! He told the people in Thessalonica the same thing. He said that at the sound of the trumpet, at the coming of the Lord, those who were alive would be “caught up to meet the Lord in the air.” I say again, Paul was addressing people who were alive 2,000 years ago, not people living today… there is so much more to say, but you’ll have to read Bamboozled Believers. Bamboozled Believers gives you the key to understanding the Bible: SIMPLY ACCEPT WHAT IT SAYS AND STOP FORCING FUTURIST DELUSIONS INTO THE TEXT! Bamboozled Believers could have been titled “Bible Prophecy Fulfilled” because in it you will be challenged to contemplate the fact that Christians of all denominations have made a very big blunder… “Biblical prophecies fulfilled” is a topic that our esteemed leaders don’t want to discuss. If we have been bamboozled long enough, we tend to reject any evidence of the bamboozle. We’re no longer interested in finding out the truth; the bamboozle has captured us. It is simply too painful to acknowledge, even to ourselves…that we have been so credulous. This book will change your bible study forever! Where should we send your free sample?